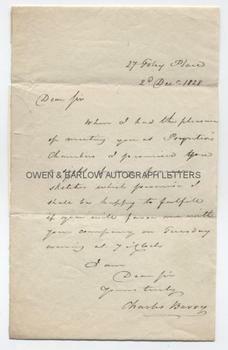 SIR CHARLES BARRY Autograph Letter Signed. British (English) Architect of the Houses of Parliament. ALS. 1p. 27 Foley Place. 2nd December 1828. To an unnamed correspondent. "When I had the pleasure of meeting you at Poynter's Chambers I promised you a sight of my foreign sketches which promise I shall be happy to fulfill if you will favour me with your company on Tuesday evening at 7 o'clock." 8vo. Approx 8 x 5 inches. 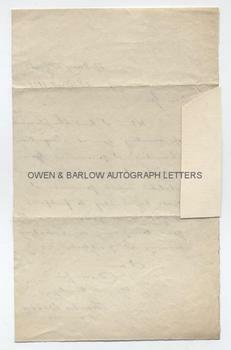 Lacking integral blank leaf and with part of old album leaf affixed to left edge of blank verso. All else fine. Sir Charles Barry is best known as being the architect of the Palace of Westminster (the "Houses of Parliament") in London - one of the most instantly recognisable of all London's buildings. He was also the architect of many other landmark buildings, often in the Palazzo style which he is credited with introducing to British architecture. These include the country houses Trentham, Harewood, Cliveden and Highclere, the remodelling of Trafalgar Square, Pentonville Prison, the Cabinet Office Whitehall, the Reform Club, Manchester Art Gallery, the Royal College of Surgeons, and many more. Charles Barry was an accomplished artist and had exhibited at the Royal Academy between 1812 and 1815. He might have become a painter rather than an architect. When his father died, the young Charles Barry inherited sufficient money to fund a Grand Tour from 1817 to 1820. He travelled extensively through the Mediterranean, Greece and the Middle-East making sketches and, whilst in Greece, had stayed with the artist Charles Lock Eastwood. In Italy, Charles Barry was exposed to Renaissance architecture and also met the architect John Lewis Wolfe. It was here that Barry was inspired to become an architect. It is the sketches made whilst on his Grand Tour that Barry is inviting his unnamed correspondent to view. At the date of this LETTER, Charles Barry was still only 33 and was only just beginning his career and his major work lay in the future.